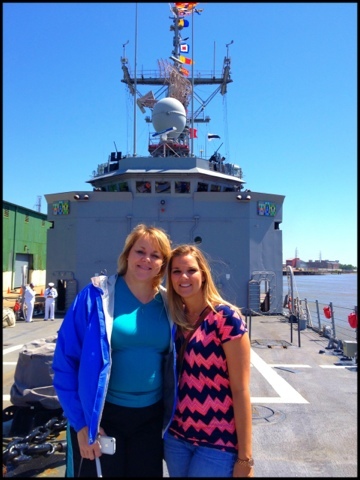 So while on our trip to New Orleans, Mom and I took a tour of the USS de Wert. IT.WAS.SO.COOL. 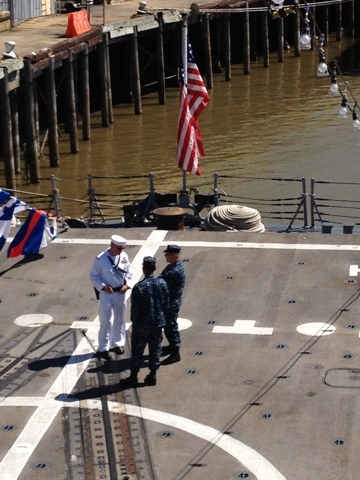 I have been on military ships before, but maybe I was too young to appreciate them? I'm not sure why, but I fully appreciated the ship, crew and their missions this time. we had a small little group tour the ship with us, so I got to ask lots of questions! Haha. Frank and Lupe were our guides and they were awesome. 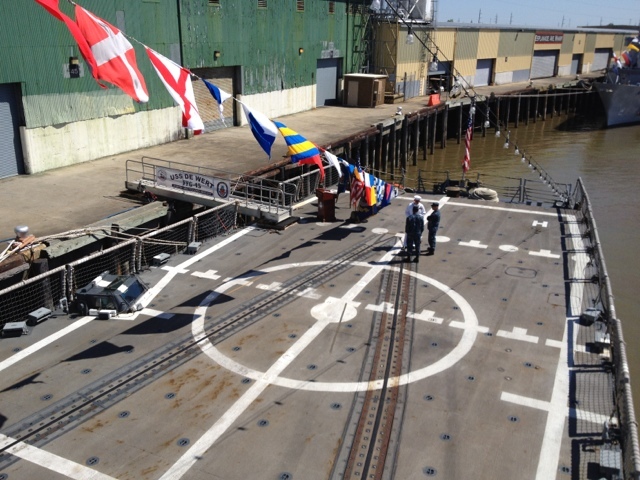 Both are active NAVY members on the USS de Wert. Crew members talking at the back of the boat. 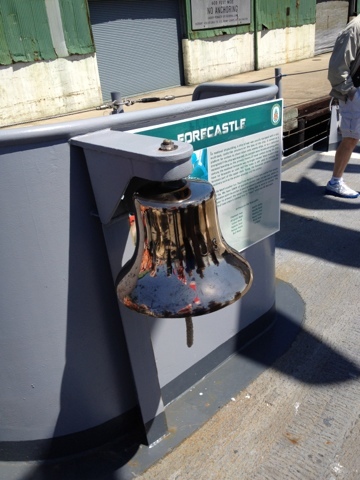 The is the bell for the ship. They use it when there is dense fog. If you are a crew member, you can have your baby baptized in the bell on the ship! The names and birthdates of all the babies are inscribed on the inside of the bell. COOL! This is called Sea Whiz. They sometimes call it R2D2, one because it looks like R2D2, but also because it functions like R2D2. It can detect missiles and enemy objects from miles away. 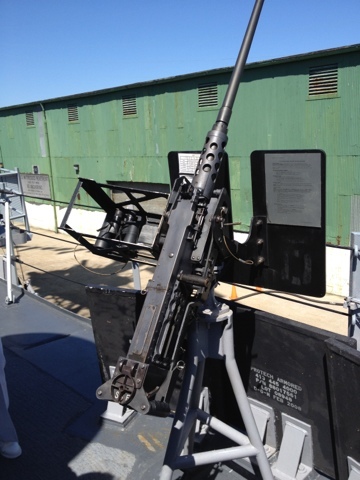 It can also fire up to 4,000 rounds per minute. It has a saltwater cooling system, so it is able to fire rapidly and cool itself off quickly. So this bad boy is the Mark 75 "light weight." No one was sure why it is called light weight, because clearly it is not. 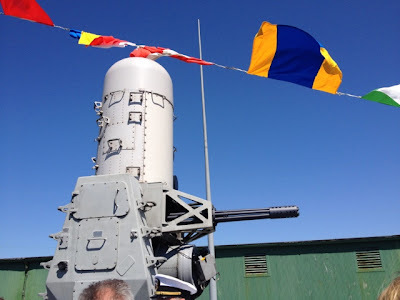 It can fire up to 80 rounds per minute and can shoot up to 9 miles away!!!! 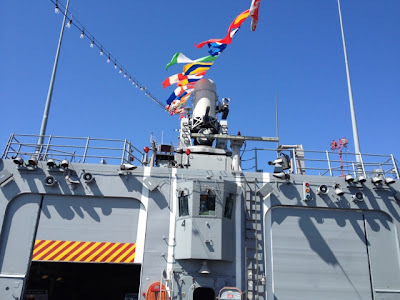 It is used for air and surface defense and also has the salt water cooling system. This is Lupe. She was fabulous. Here, we are in the the driver's seat, or the equivalent. All the steering and directing goes on here. 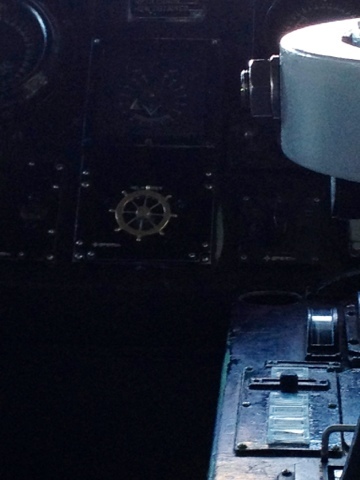 Directly below it is the captain room. I can't remember the name of the other room below this, but I do know we had to turn off our phones and were not allowed to take pictures. It was basically the room that controlled SeaWhiz and the other weapons on board. It also had the doppler radars down there scanning the area. It was way cool. 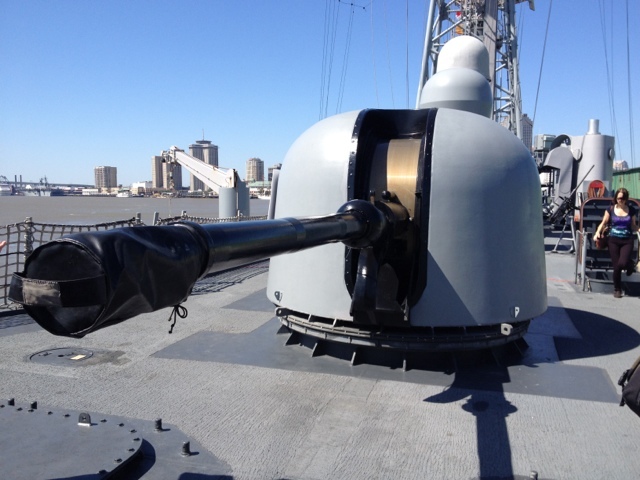 Lupe compared this little wheel to those giant wooden wheels we see on Pirates of the Caribbean used to steer the ship. This little wheel is the exact same concept and is used to steer the ship. Looking up at Sea Whiz. There are about 200 crew members on the ship. 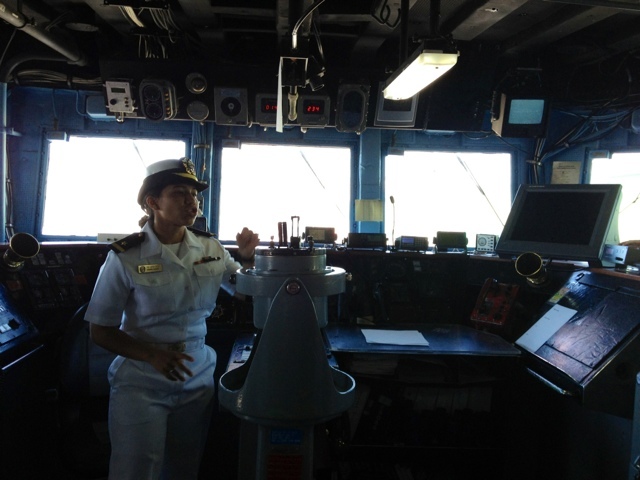 There is always a watch crew on duty, whether at sea or port. When the ship is docked, they have rotating shifts. Those on "liberty" are free to leave the ship and visit the city. Then there are those that are required to stay and man the ship. I asked Lupe about uniform selections. Ladies, you'll be happy to know there are plenty of uniform options! Frank and Lupe told us the story of the Montecristo Italian ship that was hijacked by pirates. 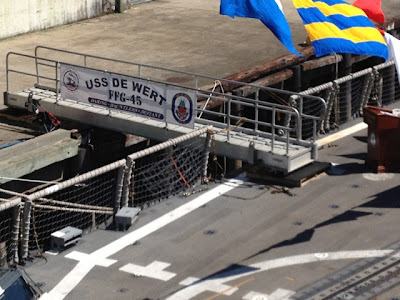 The USS de Wert rescued that ship! This happened in 2000 and you could tell they were so proud of their accomplishment. That was their contribution to a peaceful society. How awesome! Read the CNN story here. Can travel 30-plus knots and the "plus" part is classified. Mom and I at the front of the ship.